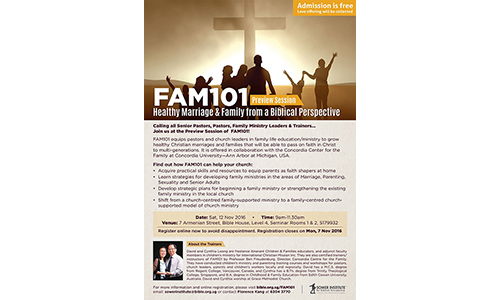 Date/Time - 12 Nov (Saturday), 9 a.m. – 11.30 a.m.
Register for the preview session of FAM101, which trains and equips pastors and church leaders in family life education or ministry to grow and sustain healthy Christian marriages and families to strengthen and pass on faith in Christ to multi-generations. Organised by The Bible Society® of Singapore. Register by 7 Nov. Free admission but a love offering will be collected. For more info, visit www.bible.org.sg/sower-institute, email sowerinstitute@bible.org.sg or call Ms Florence Kang at 6304-3770.